She's one of America's busiest conductors, and this year, JoAnn Falletta has been racking up the frequent flyer miles. "I'm with the Buffalo Philharmonic as their music director," she explains, "and the Virginia Symphony as music director, and I just added, this year, principal conductor of the Ulster Orchestra in Northern Ireland. And that's a very different experience, and a wonderful experience. So I've been traveling a lot between the three orchestras." JoAnn Falletta also loves performing chamber music, playing guitar in an ensemble that also includes her husband. Any time JoAnn Falletta makes music, she remembers what she learned from her mentor, Leonard Bernstein. "He never talked about technique," she recalls. "He would never talk about how to beat this, or how to show this crescendo, or what you should do in this difficult rhythmic section. It was all about what the music meant emotionally, where to find the passion in the music. As much as he loved every detail of the music, it was about reaching into the music and sharing that passion with the audience. That's the biggest lesson for me. What we do on the stage has to go right across the edge of that stage and wrap itself around the audience. That's why we're making music." On their latest release, JoAnn Falletta and the Buffalo Philharmonic are wrapped up in the music of the great American composer George Gershwin. Falletta believes this music is a natural fit for the Buffalo Philharmonic. "Those rhythms, the kind of swinging quality that Gershwin has, the easiness of it. It's not easy to play, but there's kind of a swing that feels natural, that feels American, that's in our vernacular. It was really tailor-made for the BPO. It was so much fun to do this." American pianist Orion Weiss is the featured soloist on this new release. Weiss studied with Emanuel Ax at the Juilliard School. Last summer, he made his debut with the Boston Symphony Orchestra, filling in at the last minute for Leon Fleisher. 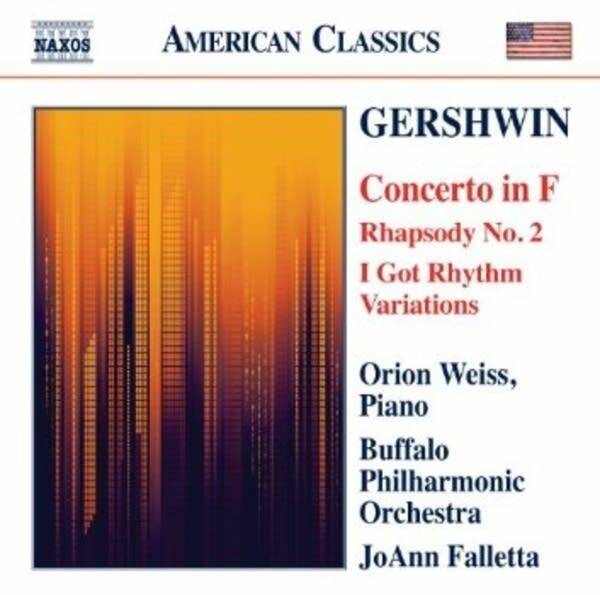 On this Gershwin recording, his first with the Buffalo Philharmonic Orchestra, JoAnn Falletta says Weiss shared a new perspective, "Orion Weiss was a wonderful partner to us because he brought his own take on Gershwin as a very young person — the kind of swagger of it. But he added a sort of elegance and classical balance that made us think about the music in a different way." Gershwin's Concerto in F was commissioned by Walter Damrosch, who almost dared Gershwin to compose what he called a "proper" concerto, in three movements. "And Gershwin stepped up and wrote this amazing, kind of quintessentially American serious concerto," explains Falletta, "with all of the wonderful American rhythms. There's a Charleston in there, there's blues, there's the kind of rhythms that only could have been born in the U.S. It's fantastic. It's lyrical, it's evocative, it's jazzy, it's filled with pizzazz, it's very difficult, and it's one of the great pieces in our American repertoire!" The final movement of Gershwin's Concerto in F is percussive, dramatic and it provides a wonderful segue into his Rhapsody No. 2. Falletta says programming these two pieces back-to-back was intentional because both are celebrations of New York City. "And some of the accented themes you hear in the opening bars, that's actually kind of a percussive sort of hammer, hammering out the next skyscraper in Manhattan. So he thought about (calling it) Rhapsody in Rivets, and then changed it to New York Rhapsody and then changed it to Manhattan Rhapsody, then finally decided on the maybe more elegant Rhapsody No. 2. But it's upbeat, it's dashing, it's really immensely challenging for the pianist. It's a brilliant piece and brilliantly scored as well." This new release closes out with a piece that was one of Gershwin's favorites. JoAnn Falletta says that the I Got Rhythm Variations, is one of her favorites, too, "It's sort of him you know? He had rhythm, he really did. He was able to use rhythm in the most appealing, natural, jazzy, unique way."